Spanish for You! is a Spanish program that you can utilize for several ages at one time, saving on having multiple programs going at once. We chose to use Estaciones for our review study. Estaciones is spanish for seasons and this was the theme of the book. They also have Travels and Celebrations which you can see HERE. I must say I was a little confused when we first started this program. There is a great wealth of information in various forms and it will take just a little bit of work to get organized. We received the physical book of Estaciones which is jam packed with the alphabet, common words and phrases, commands, flashcard ideas and game ideas. We also received a download of the audio of the entire book, both in Spanish spoken by the author, and a second one of the entire book spoken by a native Spanish speaker. The audio was very important for us, not having studies Spanish at all, I needed correct pronunciation. We are not only reading it, but hearing it as well. The Lesson Guide is in a pdf format. This gives you the lesson plans, and which audio to listen to as well as which worksheets to print out. They aren't numbered as easily as I would have liked, and use Spanish words to find them. It may be beneficial to print them all out and put them in order in a binder to make it easier for the school year. The guide is organized to be used for 4 days a week. Each day takes 10-30 minutes to complete. Here is an example of what week 1 looks like. Each day took only about 15 minutes, but we chose to listen again to the audio. These flashcards can be printed out on card stock or glued to index cards. They have several games that incorporate these cards. The worksheets come in a separate download. They are organized into grade levels for 3-4, 5-6, 7-8. Thankful also for the answer key! Spanish for You! Estaciones sells for $64.95 for grades 3-8. If you prefer to teach a more specific grade you can purchase one combo of grades 3-4, 5-6, 7-8 for $39.99. If you are teaching multiple levels, or have other children coming up the ranks it would be beneficial to buy the package that includes all of the grades. Spanish for You! does have some Free mini lessons that you can download and try out to see how if fits in with your student. 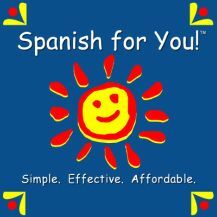 See what other reviewers are saying about the Spanish for You program by clicking the banner below!